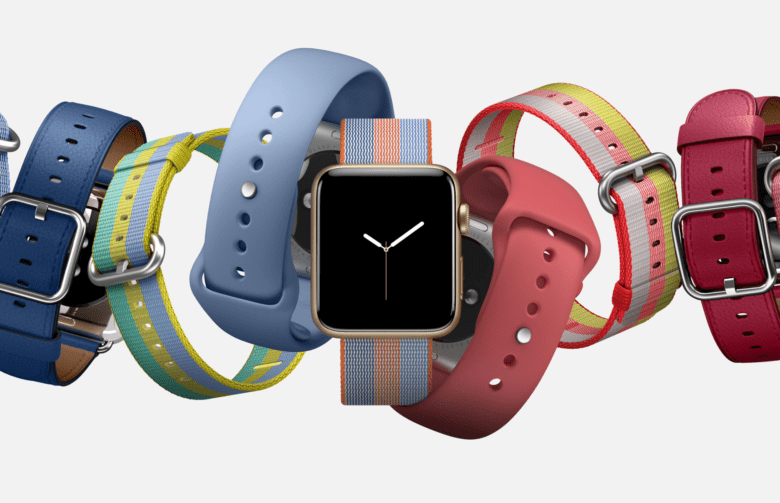 Apple refreshed its Apple Watch band lineup just in time for spring fashion freaks. The collection consists of woven nylon, sport, Nike Sport and Hermès bands in fancy new color options — all of which are available to purchase today. The new bands are available with an Apple Watch attached, but can also be purchased separately by those who already own Cupertino’s most personal (and easily accessorized) product. The new woven nylon collection includes bands in berry, Tahoe blue, orange, red, pollen and midnight blue. Some boast zippy new stripes; all cost $49 apiece. The new sport options come in camellia, pebble and azure, also priced at $49. New Nike Sport bands are available in black and volt, anthracite and black, and pure platinum and white for $49. The classic buckle collection now includes saddle brown, berry, taupe, sapphire, red, midnight blue and black for $149 each. The new Hermès straps are the priciest. The leather single tour, which now comes in lime epsom, colvert swift and fauve barenia, is priced at $339. The new fauve barenia and bleu zephyr double tour straps run $489. A double buckle cuff in fauve barenia costs $689. Unlike the new (PRODUCT)RED iPhone 7, the updated iPhone SE and the new 9.7-inch iPad — which don’t go on sale until Friday — the spring 2017 Apple Watch collection is available to order today from the online store, and for pickup at your local Apple store.